Putting [TM] into schools is a fabulous idea, because it’s all very well to talk about it, but when you actually put it in the mainstream.. .. this is what people need, they don’t need high-minded talk, so much as results. So for you to be able to say, the kids love it, the kids in the West bank love it, the kids in Brazil love it and you’re actually getting results... That’s what I love about what we’re involved in right now, why I’m so happy to do the concert, it’s so inspiring. In moments of madness, meditation has helped me find moments of serenity — and I would like to think that it would help provide young people a quiet haven in a not-so-quiet world. It was a great gift that Maharishi gave us. For me it came at a time when we were looking for something to stabilize us towards the end of the crazy sixties. It’s a lifelong gift, something you can call on at any time. It gives me great pleasure to be part of this evening. I feel the aims of this charity are wonderful ! Over forty years ago, we ended up in Rishikkesh with Maharishi. Since then, sometimes a lot and sometimes a little, I have meditated. My mantra is a gift Maharishi gave me, something I could use and something no one could take away. It’s one of the few things I was ever given that means so much to me. The David Lynch Foundation’s goal to teach a million children meditation will be like a million steps in the direction of world peace. How great to be playing with Paul, Ringo and Paul Horn again — as we did in India in 1968. And now we see the amazing results of our work from 40 years ago to bring meditation to the whole world. It’s the same message today, which is “Change begins within”. I’ve been meditating since 1966. In this age, so full of stress, young people gain the experience of the quietness and peace which lie within. This is then carried with them throughout the day, bringing a sense of greater joy, creativity, fulfillment. This event to me is one of the most important events to happen at this moment in history.Our kids are living with this chaos, this stress...... . The message that should be sent all around the world is that all of us on this planet can talk about peace, but peace begins within all of us... This is the right thing to do, this is what should be in the school system, but also should be part of our daily lives, throughout. One of the things that impressed me so much about TM was its simplicity. It’s not ideologically driven, it’s not dogmatic, it’s a simple practice that calms the mind. 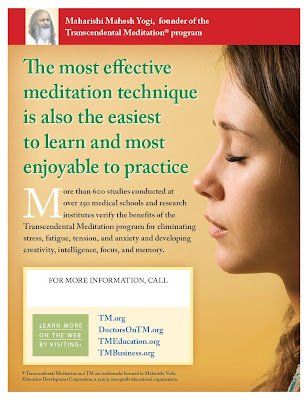 Transcendental Meditation may very well be the thing that is able to help these unfortunate children better cope with the stressful world we live in today. I did meditate actually before I came down here, I’ve been meditating 37 years ! I’ve been meditating for 38 years. I say to people, Maharishi was a living saint for what he has done for the world. I am so proud to stand before you tonight and say, somewhere Maharishi is looking at this crowd saying, this is wonderful, this is a fulfillment of desires. I’m a meditator, I operate most days from my meditation. It gives me the ability to function in the world when the outside is full of stress. when I operate from my meditation, from that stillness, it’s much easier, it’s simple. My children are meditators. It’s changed their life, and I want to give this gift that I’ve given my children, to all kids. This is not a luxury — this is the missing link to a healthy, happy, successful life. Ringo Starr is interviewed by DLF.TV’s Heather Hartnett as he gives advice to young artists, talks about his involvement with Transcendental Meditation and the Change Begins Within Benefit Concert. Ringo Starr and Paul McCartney played together for the first time since 2001 at the Change Begins Within concert at Radio City Music Hall on April 4th, 2009 hosted by the David Lynch Foundation. Go to: http://www.perripictures.com for more information. Film clips from the documentary SCHOOL OF THOUGHT appeared during a big screen video presentation at the PAUL MCCARTNEY & RINGO STARR Benefit Concert - "Change Begins Within" - for the DAVID LYNCH FOUNDATION at Radio City Music Hall, New York on April 4, 2009. Somethings happening deep in the heartland of America. Some folks are starting to call Fairfield, Iowa the Midwestern Stepford. A few locals claim theres a creepy cult slowly taking control of their comfortable small town. Even the County Commissioners are saying, We really dont know whats going on here. But a legendary Hollywood director and the local school hes teamed up with know exactly whats up in Fairfield. Youll be fully engrossed with this intriguing journey through the boys and girls meditation rooms and the giant Golden Dome of this Consciousness-Based educational institution where thousands of the Fairfield faithful meditate together. Its an unbelievably peaceful K-12 school where the upper grades consistently score in the top 1% of the nation on standardized tests, the athletes win state championships every year and each student is required to meditate twice a day.